Preheat oven to 450° F. Remove shells and tails from shrimp. Using a paper towel, blot any excess moisture from shrimp. In a small bowl, toss the shrimp with the olive oil, garlic and red pepper flakes. Spread the salsa onto the crust, leaving a 1" border around the edge. 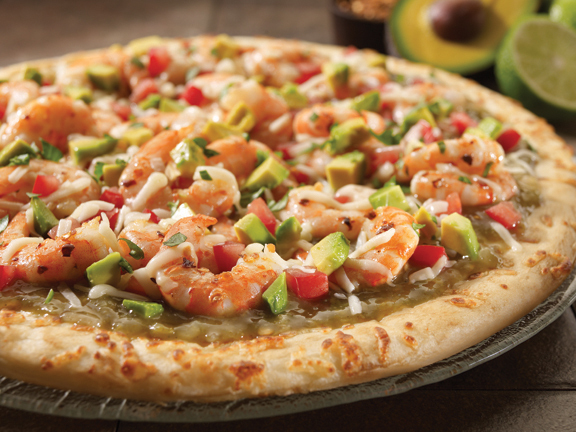 Layer the shrimp, cheese and tomatoes over the salsa. Bake pizza for 10 – 12 minutes until cheese is bubbly and crust is golden brown. While pizza bakes, dice avocado and squeeze the lime juice over it. Remove pizza from oven and top with avocado and cilantro before serving.